The Irascible Professor-commentary of the day-11-05-02. Part-time faculty - higher education on the cheap. "That which costs little is less valued."... ...Miguel de Cervantes, Don Quixote. Commentary of the Day - November 5, 2002: Part-time Faculty - Higher Education on the Cheap. The American Council on Education (ACE) has just released a report on the dramatic rise in the numbers of part-time and non-tenure track full-time faculty members in American higher education. As the Irascible Professor has noted in earlier commentaries, the growth in the percentage of courses taught by part-time and full-time temporary faculty in the California State University system has been on the rise ever since the budget crunch of the early 1990's. ACE represents the "management" side of American Higher Education, so they euphemistically refer to part-time faculty members and nontenure-track lecturers as "nontraditional faculty". The choice of this term suggests that, at least in the view of "management", the growing trend towards populating the ranks of college and university teaching staffs with an exploited underclass of part-timers and nontenure-track lectures is a permanent feature of the American higher education landscape. Nevertheless, the ACE report is valuable because it helps to quantify the extent to which part-time and other temporary faculty members are employed in the classrooms of American colleges and universities; and, it also shows the extent to which their pay and benefits differ from their tenured and tenure-track colleagues. Over the last 15 years there has been a substantial growth in the number of students enrolled in higher education in the United States. As a result, both the ranks of full-time tenured/tenure-track faculty and the ranks of part-time and nontenure-track full-time faculty have grown. However, the number of part-time faculty and nontenure-track full-time faculty (lecturers) grew explosively during the period from 1987 through 1993. During that period 120,000 new faculty were hired, 82% of which were part-time. The trend towards hiring more part-time instructors and nontenure-track lecturers rather than full-time, tenure-track faculty members continued throughout the 1990's. The overall result is that nationwide only 38% of college and university faculty members now are full-time tenured or tenure-track. By 1998 the percentage of full-time tenured and tenure-track faculty teaching in community colleges had dropped to less than 25%, which may not be a great surprise. More surprising is the fact that the percentage of full-time tenured and tenure-track faculty teaching in private universities and colleges was actually less than in comparable public institutions. For example, in private comprehensive universities the percentage had dropped to 34% by 1998 compared to 52% for public comprehensive universities. At private liberal arts colleges the percentage of full-time tenured or tenure track faculty had dropped to 38%. Although definitive data is not yet available, most observers estimate that the percentage of part-time faculty in the higher education workforce has continued to increase in the past four years. One surprise to emerge from the report is the stark difference in qualifications between part-time and full-time nontenure-track faculty and tenured/tenure-track faculty. 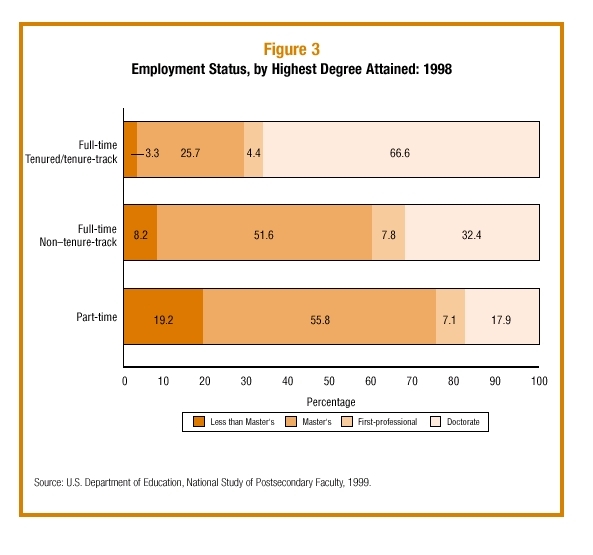 As the following figure from the report shows only about 25% of part-time faculty hold a Ph.D. or equivalent degree compared to 71% of full-time tenured or tenure-track faculty. The IP would be first to admit that holding a Ph.D. or similar degree is no guarantee that an instructor is a good teacher. However, if there ever was a truism in education it is that you can't teach what you don't know. Instructors who hold only a masters or bachelors degree are more likely to be less experienced in their disciplines. Not as surprising, but nevertheless equally disturbing is the extent to which part-time faculty members are exploited economically. According to the ACE report, tenured and tenure-track faculty in 1998 averaged a total of $59,141 in salary from their college or university. Non-tenure-track full-time faculty averaged $41,449, and part-time faculty averaged $11,533. The workload for full-time faculty, tenured/tenure-track or not, was about the same on average: 3.8 course sections plus a little more than 15 hours a week of committee work, office hours, and advising. The workload for part-time faculty averaged 2.6 course sections plus 10.4 hours of other duties such as office hours and advising. Thus, the full-time faculty members average workload was about 1.5 times the average part-timer's workload. On a full-time equivalent basis, the part-timer was paid at the meager rate of $17,300 on average. The situation with regard to benefits is equally dismal for part-time faculty. While 99% of full-time faculty receive both health and retirement benefits from their institution, only 36% of part-time faculty members received health benefits, and only 54% received retirement benefits. Few would argue that all college and university teachers ought to be full-time tenured or tenure-track faculty members. Part-time faculty members give departments and programs a degree of flexibility. Part-time assignments, usually in laboratory or composition courses, often give graduate students the opportunity to learn how to teach, and part-timers who hold full-time jobs outside the academy often bring an expertise to specialized courses that is not present among the the full-time faculty. Likewise, retired full-time faculty members frequently will do some part-time teaching, bringing to the students in their classes a lifetime of experience. However, in the view of the IP, this recent trend of using more and more part-timers and nontenure-track full-time lecturers to teach the core undergraduate courses in a discipline is a very bad deal both for students and for the institution. Part-time and nontenure-track full-time faculty bring less background and experience to the classroom. They are far less likely than tenured or tenure-track faculty to participate in faculty development programs aimed at improving teaching skills. They are less likely to be actively involved in the research and scholarly activities that keep a faculty member up-to-date in his or her discipline. Because many part-time faculty members must hold a number of jobs to make ends meet, they are less likely to be available to students at a particular campus outside of class hours. With no long-term commitment to the institutions they serve, part-time and nontenure-track full-time faculty members are much less likely to take part in committee work or governance activities. The evaluation of part-time and nontenure-track full-time faculty members is based almost entirely on student evaluations of teaching. Part-time faculty members often adjust the course work that they assign as well as their teaching style to ensure that they will receive good student evaluations. The implications for the grade-inflation problem are obvious. Most importantly, however, part-time and most nontenure-track full-time faculty do not contribute to the administration and governance functions of the academy. Even with the growth of a bloated administrative class in higher education, much of the day-to-day administration of these institutions is done by the full-time tenured and tenure-track faculty members. They are the ones who worry about programs and curricula. They are the ones who develop new courses. They are the ones who advise students about their programs. In fact, they are the ones who worry about students as individuals rather than as numbers. They serve on the academic senates and numerous department and university committees necessary to the smooth functioning of the institution. They are the ones who carry the institutional memory needed for the very survival of the enterprise as it lurches from one set of administrators to the next. As the number of full-time tenured and tenure-track faculty members has dwindled, effective institutional administration and governance has suffered. Too frequently, large chunks of the money saved by using more and more part-time and temporary faculty members have gone to propping up increasingly centralized and bloated campus administrations remote both from the classroom and from students. Here in the California State University system the central administration has finally acknowledged the fact that our campuses are woefully short of tenured and tenure-track faculty. New hiring initiatives are in place. However, with the current budget crisis facing California and the rapid increase in the number of students seeking admission, it is not at all certain that these efforts will be successful. Similar problems face colleges and universities across the county.